The Thursday before Jesus’ trial and crucifixion was the awaited celebration of Passover. In this day, we have a picture of Jesus, in all his humanity, and in all his deity. All four of the Gospels written about Jesus’ life have an account of this day’s events (Matthew 26:17-75; Mark 14; Luke 22:7-65; John 13:1-18:27). When Jesus and his disciples gathered around this meal, there was not just looking back, but also a looking forward. The disciples still may not have understood that Jesus was hours away from dying. However, I’m sure they listened carefully to his teaching in those sacred moments together. This particular Thursday is known as Maundy Thursday. Maundy means “commanded” and also can refers to the ceremonial washing of feet. Jesus took upon himself to wash the dusty feet of his disciples, modeling for them his command to love one another (John 13:34-35). Then out of the darkness, Judas came to betray Jesus. He was leading a group of the religious leaders, along with a huge company of soldiers. Although Jesus’ disciples wanted to resist his arrest, Jesus refused their intervening and surrendered himself…not to the mob but to the will of the Father. The betrayal was complete. His disciples fled (although those closest to him would soon follow). He would spend the rest of the night in the tormenting custody of his enemies. The countdown to the cross has begun in earnest. A countdown that actually began at the Fall of humanity, and, under the careful watch of God, our Father…a countdown toward restoring us back to Himself. Maundy Thursday 2015: The History Behind The Holy Thursday Before Easter – Also enjoy the beautiful Lent Meditations Slideshow at end of article. On this long day, Jesus would demonstrate in one situation after another that he spoke and acted with the authority of God Himself. The barren fig tree cursed by Jesus the day before had indeed withered and died. The disciples saw it themselves that morning as they walked again from Bethany to Jerusalem. Jesus spoke to them of faith, which they would need all the more in the days ahead (Matthew 21:21-22). Again and again…in Jerusalem, in the Temple and on the busy streets during Passover, Jesus was confronted by the religious leaders. They were determined to trap him in some sort of blasphemous teaching or interpretation of the law. It would not happen, yet they were set on his destruction one way or another. Two commands: 1) Love God with your whole being; 2) Love your neighbor as yourself. Some might say that a third is presumed in that you must love yourself in a right and wholesome way in order to truly love others. Jesus’ love for the Father and his love for all people were in perfect unity. Loving God, with all we are, gives us perspective and capacity to love those around us, whomever they are, as we have experienced love ourselves, from the God we love. 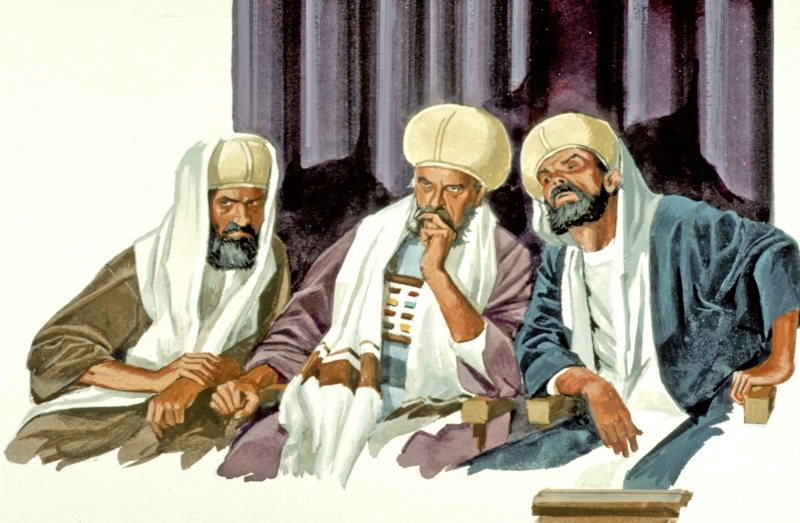 The Pharisees, Sadducees, and other Jewish leaders grew more angry at Jesus and were vexed as to how to destroy his popularity and influence with the masses of Jews loyal to him. All their trickery that day failed. Jesus was not intimidated by them, and in fact, spoke some of his strongest words against them while teaching that day. His 8 “woe to you” pronouncements against the Pharisees are listed at bottom of this page. When I read them, the song from the original Godspell film comes to mind as the Jesus character stands against the religious “machine” of his day – those “hypocrites”, those “blind guides” of the people. Finally, leaving Jerusalem that day, Jesus stopped on the Mount of Olives (Olivet) to speak about the future. He talked at length, to his disciples and all those who followed, about the end times, cautioning them about false teachers and the evil that would rise up in those last days. What it must have been to listen to Jesus, the Messiah, the day. Filled with a mixture of faith in him and fear of what could lie ahead for them, and the generations to come. When Jesus and his disciples returned for the evening to Bethany, Judas Iscariot, one of the twelve, stole away and met with Jesus’ enemies. [Matthew 26:14-16] He would betray Jesus to them in the dark of night, away from the crowds who would have strongly objected…in just two more days…for 30 pieces of silver…Judas would seemingly take history into his own hands, but the clock was already ticking, and Jesus would finish what he came to earth to do. 1- Woe to you, scribes and Pharisees, hypocrites! for you shut up the kingdom of Heaven against men. 2- Woe to you, scribes and Pharisees, hypocrites! for you devour widows’ houses, and pray at length as a pretense. 3– Woe to you, scribes and Pharisees, hypocrites! for you travel land and sea to win one proselyte, and when he is won, you make him twice as much a son of hell as yourselves. 5- Woe to you, scribes and Pharisees, hypocrites! for you pay tithe of mint and anise and cumin, and have neglected the weightier matters of the law: justice and mercy and faith. 6- Woe to you, scribes and Pharisees, hypocrites! for you cleanse the outside of the cup and dish, but inside they are full of extortion and self-indulgence. 7- Woe to you, scribes and Pharisees, hypocrites! for you are like whitewashed tombs which indeed appear beautiful outwardly, but inside are full of dead men’s bones and all uncleanness. Happy Weekend…without further ado, here are my Friday Faves, before it gets too much farther into the weekend. Enjoy. 1) My Happy Place – “My happy place” has usually been a phrase that makes me cringe when I hear it. What does that really mean? Then it came to mind this week as I strolled through a local business. RVA Antiques. This huge space is a showcase for all things 20th Century, upcycled and updated for today’s customer. Artful and lovely. Having just picked up a prescription at the pharmacy next door, I had some time on my hands so popped in…just on a whim. It was a real refreshment for my soul. I like old things…the stuff of my mom’s era makes me think of her…and that makes me happy. Words also just bring smiles …those words worthy of being painted on a canvas or splashed on a piece of wood. Just strolled around the different vendors’ booths. Even met one of the owners, Dean Lewis, who made me feel welcome. Now that my understanding of such “a happy place” has been enlarged, what’s one of your “happy places”? 2) Preventing Generosity Burnout An article by Adam Grant and Reb Rebele got me thinking this week about generosity burnout. Beat Generosity Burnout confronts the crucial fine line between effectively helping others and giving so selflessly we lose our joy and capacity. We burn out. If we base our helping on “the need”, we won’t build in safeguards, boundaries if you will, to determine how best to meet that need. Serving our communities is definitely something we need to always consider, but we serve best by applying sustainable, capacity-building planning and practice. Think of the ways you serve your various communities across a typical week or month. Are you all-in or holding back out of fear of too great a commitment or fear of burnout? Or what else? We definitely want to rise above the latter but what might “all-in” look like to be sustainable? For you personally and for the sake of the community you serve? I would love this sort of dialogue with you. Either in Comments below or via email. 3) Whistle-blowers – Who are these people? These who bring unethical or illegal practices into the light? These who risk reputation and career…even more at times…to expose wrong? This was a big news week in America. One of those related to Christopher Wylie, a former employee of Cambridge Analytica (CA) and a whistle-blower. Wylie revealed an incredible, yet not-surprising abuse of Facebook user data by the political consulting company Cambridge Analytica. This company has probably had influence on presidential elections in the US, Kenya, Argentina, and other countries. First, the company secured Facebook user data by claiming it would be for academic research purposes rather than commercial purposes. Then the company used an app (a pop-up quiz on Facebook) to glean more data about the user’s personality. This was multiplied through the users’ friend lists…resulting in millions of Facebook users manipulated by Cambridge Analytica. Based on their findings, CA would then post “fake news” to these users’ pages that would move them to possibly vote in a certain way. This is essentially “weaponizing the internet”. I’m not sure of Christopher Wylie’s motives in whistle-blowing at this time, but it definitely gives pause to every request we consider in clicking yes to an app having access to our data. What is also thought-provoking is how this practice goes much farther back than just the 2016 presidential election. Something to ponder…thanks to Christopher Wylie, previously the perpetrator, now a champion for truth. 4) Spotify – So many of you may already use Spotify, this music service for smartphones and computers. I’m a late adopter but now I’m a happy consumer of this free medium. Especially since Beyond the Guitar has his first album on the site. So nice just to be able to click on, and listen to Nathan’s music while I’m driving or working. His first published original composition, Evenglow, is also available on Spotify. Be a Patron – Support Beyond the Guitar music creation on Patreon. 5) Beautiful Documentaries – Documentaries are becoming film favorites of late…especially when they focus on documenting the beautiful and redemptive sides of life. Jay Lyons Productions partnered with Topher Hall to create this amazing piece with current and vintage footage for Prison Fellowship. This documentary tells the story of how people who committed unspeakable crimes found a sustaining and redeeming faith in Christ while in prison. Another of Jay’s documentaries that is coming out soon is The Long Goodbye: The Kara Tippetts Story. Kara died 3 years ago this week. She was a magnificent woman, full of love and faith. Watch for this film. Have a rich weekend. Every day is a gift, right? Love on those people around you. Love you. I want a Tshirt with this graphic on it. I also want to learn how to live “up and to the right”. This graphic comes from Andy Crouch‘s book, Strong and Weak, which is still my favorite of 2018 so far. It sets out Crouch’s premise that flourishing is how God means for us to live. How we get to “flourishing”, individually and in community, is with high authority coupled with high vulnerability. Authority is defined as “capacity for meaningful action”. Vulnerability is “exposure to meaningful risks”. These are the truest definitions. We have bent both of them to mean something else in today’s culture – either power with potential to be corrupted or a smarmy sensitivity that needs protecting. Both authority and vulnerability when aligned with the will and nature of God are so much more…and work together to make us true image bearers of our Creator and Redeemer. As community (church), we can actually move toward a flourishing that includes the most vulnerable and the seemingly least empowered. This Worship Wednesday blog is not about singing praise but about thinking and meditating on God’s Word and His intent for our lives. This past weekend, I had the opportunity to be a part of a Common Good RVA event. Andy Crouch was the keynote speaker. He spoke practically about how we could apply ourselves to the good of all, especially through the vocations God has given us. As educated and affluent, our temptation is to avoid vulnerability placing us on the left side of the graph. In our flesh, we prefer withdrawing to safety or exercising control at all costs. God calls us to a different life…a surrendered life for the common good. A writer pastor, Jonathan Storment, wrote a series of blogs, taking the reader through a thought-provoking review of Crouch’s wonderful book. Below are quotes from his review and from the book Strong and Weak. When you read the take-aways below, you’ll want to read the book…then you will be compelled to act, with authority and vulnerability. The way of Jesus is up and to the right, authority and vulnerability in the world, bearing in the world’s suffering while being a part of the God’s redemption process. I don’t think Christians are the only ones tempted to escape, and in our secular age, it’s no longer Heaven that people are escaping to. It’s much easier to stare at your iPhone than to have a conversation, slowly spend your life watching t.v. every night instead of going that group or civic effort. Now the challenge for us is to take the wisdom of these words and apply them to our lives and our community. Thoughts?